You will need to plant Daffodils and Narcissi before the end of September. Daffodils will look good planted in layers. Use a bulb planter or trowel to make a hole in the soil for your bulb to go in. Once the soil is removed, put your bulbs in. Cover these over and wait for the spring! You can plant some bulbs lower down, then cover over with soil and plant more onto and finally cover with soil. This will give a layered effect and make the area look fuller. There are many bulbs to choose from such as Alliums, Tulips and Hyacinths. 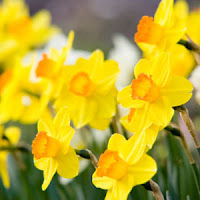 Daffodils are popular and some of our favourites are Broadway Star, Ambergate and Tahiti.